FALMOUTH, Maine -- Blue skies, temperatures in the mid 30s, more than 100 participants from all around New England and New York, a barn full of world caliber Morgans, and the 2004 People's Choice Trainer of the Year set the stage for the David Rand Clinic held March 5, 2004, at his Sheaffer Farm. The morning began with Rand and several of his clients demonstrating techniques and skills needed to put a world caliber horse and rider team together. Kelsey Ramsey set the mark with her 2004 Reserve World Champion Classic Pleasure mount Med-E-Oka French Morocco. Next came the 2004 grand national champion junior exhibitor team of Adriana Liberty and Ultra's Proclamation. Rand explained that each horse and rider combination is different. He also talked about what it takes for his riders to make their horses the best they can be. Third to go was the winning team of Caitlynn Ramsey and Lookaway's Hot Ticket. Rand s said changes must take place when a rider changes divisions. Caitlynn has moved from the junior exhibitor to the youth division. She will also be making her debut in 2005 on a new mount Monnington Wish. Caitlynn rode both of her horses to show us the change she must make to continue her victory passes with a newer, greener horse. The final rider of the demonstration portion of the clinic was amateur Erin Kelley and Bent Apple Liberty. Rand made clear comparisons of the differences and expectations he has for the four different pleasure divisions he and his riders had shared with us: Classic Junior Exhibitor, Junior Exhibitor English Pleasure, Youth English Pleasure, and Amateur English Pleasure. The next session was probably the most popular portion of the clinic as participants received lessons from Rand. Although there were only six participant spots available, nearly 20 people had tried to earn one of those lesson spots. Not only were these individuals going to be instructed by the best, but they were also going to experience the feeling of riding champions such as Robert E. Lee, Lookaway's Hot Ticket, Med-E-Oka French Morocco, CBMF Great Balls of Fire, Medomak Ever Beamin, and AFF Tailored to Taste. Participants Rachel Frazier, Sarah MacDougall, Emma Nobles, Sue Oliver, Gabrielle Blackman, and Kahla Buthlay spent the remainder of the morning getting tips on how to make their own victory passes with style in 2005. Rands's keen eye for rider and mount wowed the crowd as he made significant strides with each team as they were guided by his praise and knowledge of riding. A short lunch break was followed by a presentation by Poulin Grain regional manager Andrew Beals. He gave a visual presentation on the importance of nutrition and keeping the show horse at the top of his game. Beals' knowledge of feeds and what is needed by our Morgans to stay in top condition gave the spectators a lot to think about. After his presentation he spent time answering individual questions. Beals also informed the crowd that Poulin is a sponsor of the Poulin Grain Partnership Program with Maine Morgan. Any member who feeds Poulin grain (regardless of what animal it is for) will earn $.25 per bag to be paid to the Maine Morgan Horse Club, Inc. Maine Morgan members who are feeding Poulin grain should inform their dealers that they want to be a part of the program. The afternoon featured a sensational presentation of starting the harness horse and the different stages of training. He also emphasized the importance of keeping the horse fresh. The presentation included four harness horses. Rand's first horse was a two-year-old colt who had only been in lines about four months. He shared techniques and expectations of getting this young colt ready for shafts. The next horse was a four-year-old mare who had just started her driving training about eight months prior and was just recently hooked. He shared the importance of keeping the horse's job positive and fun, and to know how much and how often to push. Rand was very adamant about wanting all his horses to like what they do. He said he works very hard at making that a priority all through their training. His next horse, a three-year-old daughter of Lamborghini In Black, had the crowd in awe. As she came out into the arena, she spiked her tail and trotted to a beat that very few can do. One spectator's comments were: “She reminds me of Noble Flaire, the way she trots!” Rand told the crowd that this mare was a “special one” and that he is very excited about how much she wants to perform. Lastly, Rand showed a five-year-old finished driving horse. He talked about his expectations of this horse's performance and the variety he offers this horse to keep his training on track yet enjoyable. He said that it is important to offer variety to a horse that knows its job, so that boredom does not enter into the equation. Planning out a horse's work schedule is as important as executing it. 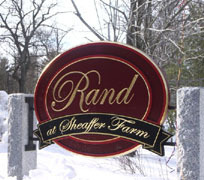 Rand's knowledge, expertise, and crowd appeal made for an absolutely divine day. It is no surprise why he was voted People's Choice Trainer of the Year for the second year in a row.